Lovely little snacks served on Indian-style pancakes. Steam the Tenderstem® for 5 minutes. When ready cut off the stalks and set aside for the paste. Transfer florets to a bowl of iced water. For the Tenderstem® and coriander paste, place all the ingredients into a food processor and blitz to a paste. You may need to add a little water. Grate the carrots and set aside. Zest and juice the lemon and set aside. To make the sambhal, put the oil in the wok and add the mustard seeds. Place over a medium heat. When the seeds start to fizzle and pop add the curry leaves, quickly followed by the chopped chillies and grated carrots. Pour over the lemon juice and then add the salt and coriander and cumin powder blend. Give it a good mix through to distribute the spices and then finally add the lemon zest. For the poodla, mix all the ingredients together to make a batter – use a balloon whisk to get rid of any lumps of flour. It should be the consistency of thick double cream. Heat a flat, preferably non-stick, frying/pancake pan and brush with some oil. Place a few full teaspoons onto the pan and use the back of the spoon to make them into perfect blini circles. Leave to cook for a few minutes until the edges start crisping up and the top looks dry in places and then flip over and cook the other side for a few minutes. You should have a golden brown colour and some little holes in the poodla. Repeat until you’ve used up all the batter. 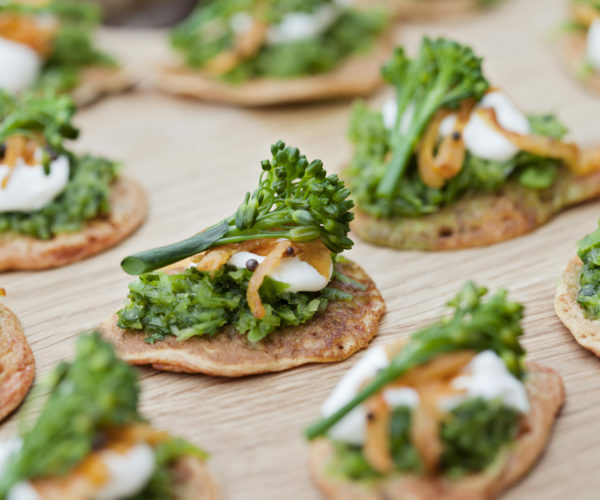 To assemble, place a little of the Tenderstem® stalk and coriander paste onto the base – about half a teaspoon. Dollop on a little sour cream . Place a little of the carrot sambhal on top of the sour cream. Place a little Tenderstem® floret on top of the carrots.